Rising demand for dental procedures such as bonding, braces, bridges and implants, crowns & caps, dentures, and filling & repairs is one of the major drivers for the global dental compressors market. The U.S. population is “graying” at a rapid rate. According to the American Association of Retired Persons, by the year 2020, approximately 25% of the population base would be above 60 years of age. With the increase in natural dentition retention, more of geriatric population is seen in dental facilities to maintain their oral health. 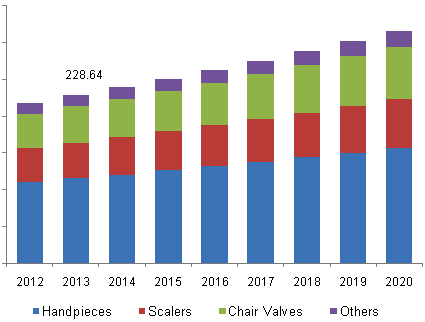 Increasing prevalence of dental disorders and the presence of amicable government reforms pertaining to the dental equipment and consumables market are expected to fuel market growth. Lubricated and oil free compressors are two key product segments analyzed in the scope of the study. Dental lubricated compressors dominated the overall market in terms of share in 2013. Relatively low maintenance and high durability associated with these devices are some major factors attributing to its large share. In addition, high usage rates of these devices in the emerging and underdeveloped markets are expected to drive growth during the forecast period. Dental oil free compressors, on the other hand, are expected to gain revenue share during the forecast period. Oil-free compressors are light weight and less costly. Dominant market players are involved in continuous R&D in order to launch new products with efficient technology. For instance, Air Techniques has launched membrane technology based AirStar 12 and AirStar 40, that are virtually maintenance free and provides clean ultra-dry dental compressed air. Oil free dental compressors are now most widely used in the field of healthcare. Increasing demand for dental compressors with reduced noise and vibration and compact shape to save space expected to drive segment growth during the forecast period. On the basis of technology, the dental compressors market is segmented into desiccant based compressors and membrane based compressors. Desiccant based compressors dominated the overall market in terms of share in 2013. Desiccant dryers also referred to as regenerative desiccant dryers are made up of two chambers. Compressed air goes through the chamber filled with desiccant which is responsible for adsorbing the moisture, therefore, reducing the air dew points. The desiccant dryers have captured great market share due to its capability of reducing the workload to a great extent. In addition, features such as desiccant dryers provide very low dew points without its potential freeze up and moderate cost of operation associated with these products are expected to drive segment growth over the next six years. However, membrane based compressors, on the other hand, are expected to gain revenue share during the forecast period. Membrane dryers remove moisture from the compressed air by passing it through a membrane material. Due to their sizes, membrane dryers are advantageous as they can be installed closer to the point of use. Dental air compressors find its utility in various application areas including dental handpieces, scalers, chair valves and other dental care devices. In 2013, Dental handpieces were the most revenue generating application area accounting for the majority of the dental air compressors market. High usage rates and rising prevalence of dental disorders are amongst key factors attributing to its large share. However, dental chair valves are expected to grow at a lucrative rate over the forecast period. Dental chairs are one of the most important equipment in any dental care facility as it allows the dentist to continuously change position in order to get better assess to the patients mouth. Dental chairs are equipped with valves which are operated through air compressor making it maneuverable. An increasing number of dentists coupled with rising prevalence of dental disorders is amongst key factors attributing for its growth rate. North America dominated the overall market in terms of revenue share in 2013, at over 30.0% owing to the presence of sophisticated healthcare infrastructure, high patient awareness levels coupled with relatively higher healthcare spending levels in the developed countries. Asia Pacific dental air compressors market is expected to grow at a lucrative CAGR of over 6.0% over the estimated period of six years. The presence of untapped opportunities, improving healthcare infrastructure, consumer purchasing power, and patient awareness levels are some factors accounting for this rapid growth. Key players operating in global dental compressors market include Midmark, Dürr Dental, Gnatus, Metasys, Tech West Inc., Kaeser Dental, Air Techniques, Aixin Medical Equipment Co., Ltd, Foshan Core Deep Medical Apparatus Co. Ltd., Best Dent Equipment Co., Limited, Slovadent, Dental EZ Group, Diplomat Dental Solutions, Join Champ and Fedesa. In order to sustain in highly, competitive market manufacturers are continuously developing novel technologically advanced products.